7: 36 One of the Pharisees: (In Luke’s Gospel, Jesus dines with the Pharisees three times.) In order for the woman to stand behind Jesus and still be at His feet, He was probably reclining on His left side as was the custom of the time. 7: 37 a sinner: The host, Simon, and the dinner guests knew the woman’s reputation. Jesus’ reputation has already been confirmed: He befriends even sinners to extend them mercy. The lavish use of the ointment is an expression of the woman’s courage and contrition. 7: 47 for she loved much: As illustrated by the parable (7: 41-43), the woman’s love was the effect of her forgiveness NOT the cause. 7: 49 even forgives sins: Jesus claims to do what the Jews believed only God can do for sinners. Jesus contrasts her acts of kindness with the lack of these signs of hospitality from His respectable host. Finally, He ignores the outrage and tells the woman to go in peace because her faith has saved her. Next time: St. Paul’s drive to demonstrate his love of Christ. Meditation: Read Romans 8: 31-39. What is the only real threat to our Salvation? “Our hearts are restless until they rest in Thee.” — St. Augustine in the Confessions. Jesus is concerned about the deepest concerns of human existence. He wants to satisfy our thirst for the ultimate meaning and purpose of life. Throughout the Gospel, Jesus offers faith in eternal life as the response to the fear of death. 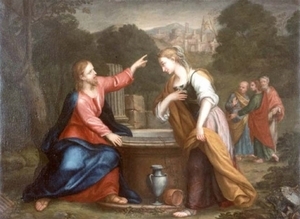 This conversation with the Samaritan woman reveals an important aspect of coming to God in conversion. God knows us better than we know ourselves and more thoroughly than we are willing to admit to ourselves. For this reason, the process of conversion entails a thorough examination of conscience, an examination that becomes clearer in the light of Christ resulting in a deeper repentance. Jesus reveals her life to her. (Jn 4: 17-18) Her response to His revelation is two-fold. She admits that she perceives that Jesus is a prophet. Secondly, she dodges the issue of her personal life of sin by alluding to a theological dispute between Jews and Samaritans about where to worship. Isn’t this just like us? Changing the conversation when anyone or Someone gets too close to the truth? Let’s examine how Jesus answers her. In John 4: 21, Jesus addresses her question directly. In John 4: 22, Jesus states the truth about salvation history. In John 4: 23-24, Jesus talks about authentic worship. God will be worshiped in spirit and truth wherever people know the truth. Hearing this she runs back to the city telling her fellow citizens about Jesus. They come out to see Jesus. After a while, they come to believe in Him “because of His word.” (Jn 4: 41) The fruit of this visit can be seen in Acts 8: 1-25 when the deacon Philip and then the apostles Peter and John evangelize in Samaria. Meditation: How do faith and charity require each other? To my non-Catholic friends who were questioning that baptism was required to be called a Christian, I would like you to read Acts looking for the essential elements of Christian initiation: proclamation of the Word, acceptance of the Gospel entailing conversion, profession of faith, Baptism itself, the outpouring of the Holy Spirit, and admission to Eucharistic communion. As time permits, we will look at these various elements, so that you can determine if baptism is necessary for yourself. I Once Was Blind; But Now I See! Then God goes on to say, “I invite you to a relationship of love: your love of me, my love of you.” Yes, God comes to us as an invitation to love. . .
At this moment love surges in our heart like a tremendous sea that takes us in and lays us in the arms of God whom we haven’t seen but in whom we believe. Across the waves we hear, “Blessed are they who have not seen and yet believe” (Jn 20:29). Now I walk in the darkness of faith and I see. I see more clearly than is possible with my fleshly eyes. Bartimaeus’ eyes are opened by Jesus in two ways. The obvious opening is the physical one. The second opening is in Bartimaeus’ response to his healing. Even though Jesus told him to go his way, Bartimaeus chose to follow Jesus. Bartimaeus is a model for the process of conversion. He had a strong faith. 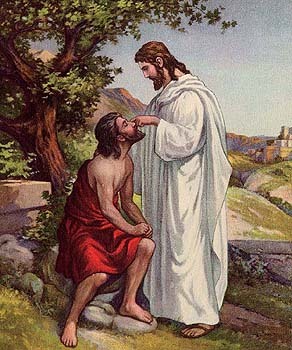 He called out to Jesus, “Son of David, have mercy on me!” (Mk 10:48) This means that he believed Jesus was the Messiah. And this belief added to what he had heard about Jesus stirred up a great trust. When asked what he wanted, Bartimaeus replies, “Master, let me receive my sight.” (Mk 10:51) What boldness! What confidence! What faith! This convert stays with Jesus to know His teachings and to be formed by them. He stays with Jesus, trusting in His wisdom. He stays with Jesus at the cross so that he finds the forgiveness of his sins through Jesus’ suffering. He stays with Jesus because the Resurrection promises new life. He stays with Jesus to be nourished and given hope. Our prayer today and always: Let us stay with you, Lord. Let us walk in your light so we may truly see! Meditation: Have we been through our own conversion process? Are we using this Easter season to really know Jesus through His word? Nothing Shall I Want and Nothing Shall I Fear! Yesterday was Good Shepherd Sunday. Thought it was appropriate to let everyone know that my two favorite Psalms are #23 and #91. I try to pray these as often as I can. I had a protestant preacher tell a group of business owners that if we pray these every single day and are still anxious and afraid, the we don’t understand (know) the God we are addressing. That was over 20 years ago. I have never forgot this little sermon and so these Psalms became a regular part of my daily prayer time. Read them, yourself, again, soon. All the Psalms are wonderful, but these two will change your life. To follow Jesus took a big act of faith on Matthew’s part. He left money and a possible lucrative career to follow an itinerant preacher. Then, Matthew brought Jesus home for a meal with other tax collectors and sinners. And the Pharisees, duly scandalized, complained to the disciples. Jesus’ response (quoted above) flew in the face of a doctrine of some of the Pharisees that stated that if all the Jews obeyed all the commandments of God for a half hour the Messiah would come. Here, Jesus was delaying the arrival of the Messiah by reaching out to sinners. That is one reason the Pharisees wouldn’t believe that Jesus was the Messiah. He thought that His Presence was not a reward for good behavior but a remedy for the bad. This episode also shows how mercy is meant to be spread around. Sinners invite other sinners to know Jesus. Meditation: Read Matthew 9: 9-13. Consider that act of trust that Matthew was making. Wanna Walk on Water? You Gotta Get Out of the Boat! And, so, in the heavenly balcony of my mind, where I have people who encourage me and lift me up, I have St. Peter. He is there, along with the Lord, Mary, Joseph, St. Paul, and my father, cheering me on in my race to eternal life. The following passages especially comfort me when I am suffering from physical pain. This suffering is all a part of the work God has given you. Christ, who suffered for you, is your example. . .
Dear friends, don’t be bewildered or surprised when you go through the fiery trials ahead, for this is no strange, unusual thing that is going to happen to you. Instead, be really glad- – because these trials will make you partners with Christ in His suffering, and afterwards you will have the wonderful joy of sharing his glory in that coming day when it will be displayed. . .
At the Sea of Galilee, Jesus preaches to the people pressed around Him from Peter’s boat. When He finishes He tells Peter to put out into the deep and let down his net for a catch. Now, Peter is an experienced fisherman; he doesn’t think they’ll catch anything during the day when the fish can see the nets being lowered and avoid being caught. Then, after a miraculous catch that fills two boats to the point of almost sinking, Peter knows that this is far beyond a natural event. He declares himself a sinful man; but Jesus says, “Do not be afraid; henceforth, you will be catching men.” (Luke 5: 10) And, they leave everything and follow Him. Notes: Peter walks on water toward Jesus, but when he takes his eyes and mind off the Lord & notices the wind and waves, he begins to sink. He cries out, “Lord, save me.” He is still not certain that Jesus is the Son of God. His profession of faith comes later. 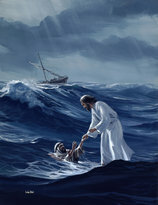 Because he followed Jesus that day, he gets out of the boat and begins to walk on water and walk toward his journey of conversion and belief in the mysteries of the faith. 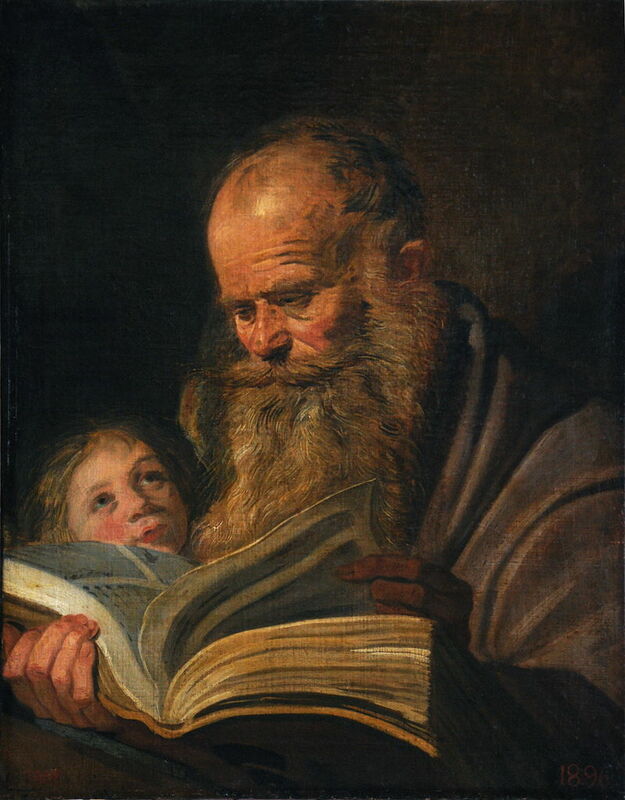 Next time: St. Matthew and Bartimaeus. Who is in your balcony and why? Conversion: It’s not Just for Pagans, Anymore. “Never completely finished in this life.” The faith journey is ongoing; a sweet adventure, the passage to an eternal life with an infinite God where we will continue to explore the mysteries of faith forever. This is one my my favorite thoughts to ponder and, yet, it is also a mystery, so I can never wrap my mind around it. It’s like looking at the night time sky and trying to imagine the universe beyond the stars that we can see: a universe that goes on infinitely; a world without end. However, I can wrap my mind around people and relationships. I know that Jesus calls us to have a relationship with Him and to convert and follow Him. We must turn away from the bad direction we are heading and find the good way. Faith is the act of believing that there is a good path to follow. Faith in Jesus believes that He is the Way to eternal life with the Father and that He will strengthen us to walk the right path all the way to its completion in eternity. On Friday, we will begin with St. Peter who is mentioned the most in the New Testament after Jesus. After studying him, we will consider St. Matthew, Bartimaeus, and the Woman at the Well. This week let us pray the 13th century prayer of St. Richard of Whyche. Meditation: How might I be blind to my own faults or sins? 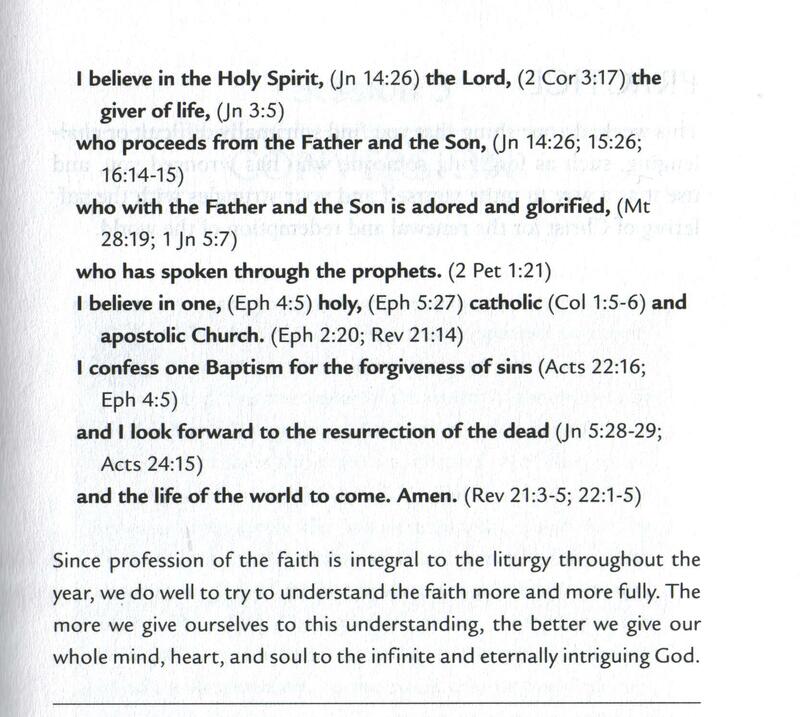 So What Do Catholics Believe? Instead of professing the Creed on Easter Sunday, the priest poses the questions of the Baptismal liturgy to the whole congregation so that we may all respond with a faithful “I do!” So, at least, once a year, we can renew our baptismal promises and affirm our assent to the fundamentals of the mysteries of our faith. 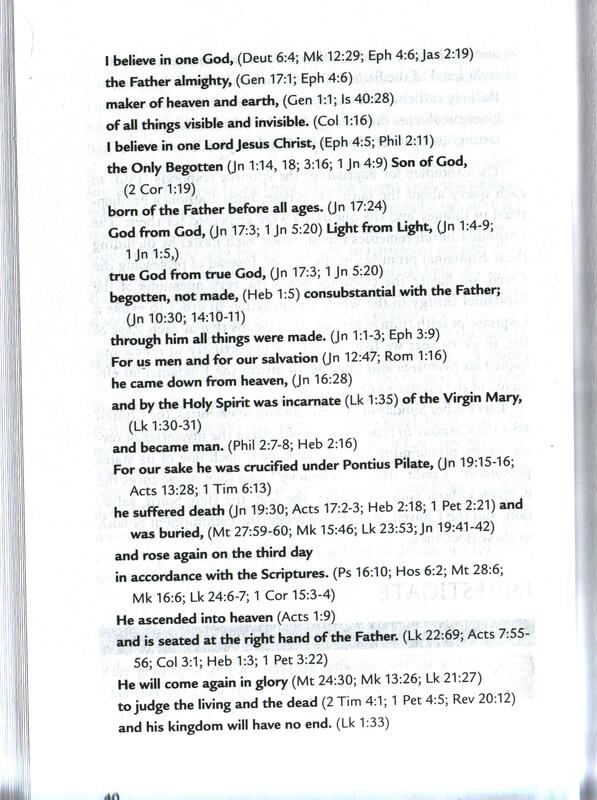 Now we are going to look up the Scriptures that underlie each statement of the Creed. May God’s grace help us to make ever deeper commitments to these mysteries. And may we come to know Him more intimately through them. Meditation: What new insight about the faith have we received from the cited Scripture readings this past week?